The Velobind Strips 12 Prong suit the VB100, VB200 and VB300 Velo Bind Machines and other 12 hole Velo and Strip Binding Machines. Designed to permanently bind confidential reports and presentations, Velobind Strips are a professional way of presenting documents. Velo Binding is widely used by Accountants for Financial Reporting and are a popular form of Strip Binding Supplies. Velobind strips 12 Prong are perfect for mailing documents as the spine won’t crush when posted. These Velobind Strips are Hot Knife type Binding Strips, whereby the Velobind Machine takes the pronged element (pins) and glues it to the receiving holed element by using heat. Holes are punched in the document using the Velobind Machine and pages then placed onto the Velobind prongs. The holed element is then lowered over the prongs and the machine then cuts off remaining exposed prongs and glues the two Velobind Elements together, binding the pages between. 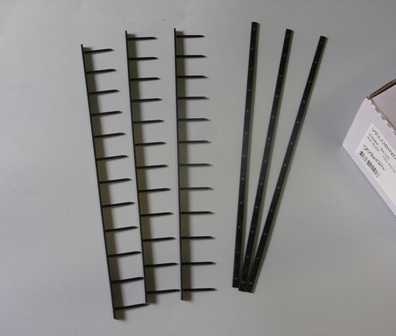 Velobind Strips 12 Prong are 25mm, or 1 inch in height and are suitable for binding documents up to 250 pages.